Given its monumental toll on victims and their families, tuberculosis could hardly claim to have a positive side. But from the 1880s until 1940, when the bronchial illness ravaged the nation, it brought surprising and lasting benefits to New Mexico. 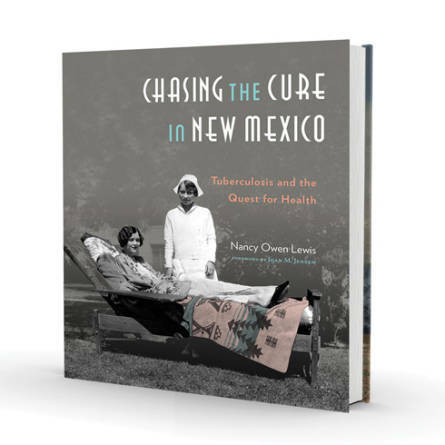 In Chasing the Cure in New Mexico, Nancy Owen Lewis lays out a thorough analysis of how the illness and the presumed curative powers of a high, dry environment led to massive in-migration, the first stirrings of public-health services, and a bounty of sanatoriums, boardinghouses, ranches, camps, and hot springs that catered to patients from throughout the nation. Between 1885 and 1890 alone, appeals to TB patients attracted 19,000 people to the New Mexico Territory—more than a tenth of the era’s non–Native American population. Their anglicizing effect eventually aided the 1912 push for statehood, and some of the individual patients changed the state forever. Among them were eventual U.S. senators Bronson Cutting and Clinton P. Anderson, future congressman Albert Simms, and future governor and Albuquerque mayor Clyde Tingley, who arrived with his ill fiancée, Carrie. Other cure-seekers included artists Gerald Cassidy, Carlos Vierra, Sheldon Parsons, Kenneth Chapman, and Will Shuster; poet Alice Corbin Henderson; and two journalists, James Ward Hicks and Willard Andrews, who together started New Mexico Magazine in 1923. (Fellow “lunger” George M. Fitzpatrick served as its editor for 34 years.) John Gaw Meem decided to pursue a career in architecture while a patient at Sunmount Sanatorium; his work became a hallmark of Santa Fe Style. Lewis doesn’t shy away from portraying the horrors of the illness or the resistance many residents had to promoting their hometowns to sick people. The public-health response, she notes, often faltered, but one of the physicians who came for a cure, William Randolph Lovelace, established a medical empire that lasts today. As for a cure, the development of streptomycin and other drugs in the 1940s proved far more effective than New Mexico’s TB industry. Vestiges of its architectural legacy remain, including Hotel Parq Central in Albuquerque, St. Joseph’s Square apartment complex in Silver City, and Montezuma Castle in Las Vegas. Chasing the Cure shines on the strength of Lewis’ research and engaging voice. Read it on a sunny porch to soak up the full effect. Mark Lee Gardner, a historian of the West, focuses his third book on a detailed accounting of how Roosevelt marshaled a force of cowboys—many of them New Mexicans—and led the 1st Volunteer Cavalry up two Cuban hills and straight into infamy. During their day, the Rough Riders caught the nation’s fancy and drew the jealousies of other fighting units that were arguably better trained, better equipped, and better prepared to drive Spain out of its last colony in the Americas. Symbols of derring-do and rugged romance, Rough Riders drew fawning young maidens as their trains headed east to Florida ports, tossing buttons torn from their uniforms to them as gifts. As Gardner notes, though, their warrior intentions were partly foiled. Higher-ups decided other units should ride into battle. Roosevelt’s Rough Riders were relegated to infantry chores. Many of them never even set a toe on Cuban soil, and those who did endured a rough, reckless, and deadly charge, mingling, sometimes heroically, sometimes abysmally, with African American troops known as Buffalo Soldiers. Gardner’s book lays out every step of those battles and the lives lost. His final chapter speaks hauntingly of loved ones left behind and of veterans’ efforts to capitalize on their fame or stumble through what surely was the lingering trauma of war. Was the Maine’s explosion an act of war or a tragic accident? Were Americans interested in Cuban independence or empire building? Did Roosevelt earn the Medal of Honor he was posthumously awarded? Gardner’s book doesn’t explore those questions, which deserve our era’s critical eye. His fast pace and comprehensive research, though, carry readers into a brief and memorable period of history, with pointy-toed boots firmly planted in New Mexico’s cowboy story. “I’ve always felt that history is best experienced on foot, if for no other reason than that was usually how it was made.” So begins Hiking to History, one of two new books bearing Robert Julyan’s name, each an indispensable addition to his writings on our state’s geographic and cultural history. Wild Guide updates Julyan’s out-of-print New Mexico Wilderness Areas. Focused strictly on wilderness areas that often abut better-known public lands, it defines what makes them special, where to hike, and what to look for. Published by the New Mexico Wilderness Alliance, it’s rich with information about geology, flora, and fauna, while lighter on hiking info. Nonetheless, trail hounds hungry for something new will welcome it as a supplement to other guides. With Hiking to History, Julyan unleashes his inner storyteller to fill in the blanks on 22 lore-laden places, ranging from how Mount Walter in Taos got its name (hint: when Harold D. Walter wasn’t shooting photos for this magazine, he climbed a lot of mountains) to how Persian ibex ended up in the Florida Mountains near Deming. Besides introducing readers to a host of colorful and thoroughly New Mexican characters, Julyan provides tips on trail conditions, lengths, and GPS coordinates. You may need all of those to find that fabled place where Ernest Blumenschein and Bert Phillips’ wagon wheel broke—the accident that gave birth to the Taos Society of Artists. Julyan describes his meticulous research, including oral accounts and photo comparisons, to alight upon the proper spot. Each chapter goes down as easily as a granola bar on the trail—with far more nutrition. Wise readers will tuck it into their backpacks to inspire the next adventure and have a little something to read around the campfire later. Skeletons live in Anita Rodríguez’s closets. Around her Taos home, dragon’s teeth lie just below the topsoil. With Coyota in the Kitchen, she flings open the closet door and digs out the dragon’s teeth (or old grievances) to reveal her family and her culture in all their beauty and pain. An award-winning artist, Rodríguez long paid her bills as an enjarrdora, a plasterer of adobe buildings, historically a woman’s job but one she had to fight for in contemporary northern New Mexico. She did so with bravado earned the hard way in a family of strong people that included her Spanglish-speaking Hispanic father and her fatally flawed Texan mother. Surely she was loved, but in a family sprawl that included alcoholism, adultery, and criminal behavior, she needed to find a stable path of her own from a young age. Good thing there was always food and always someone who knew the old recipes, simple though they were. Meanwhile, pressure cookers explode and curses take root. Rodríguez moves to Mexico and eventually comes back. Here, her aunties, cousins, and grandmother help her restore her roots. 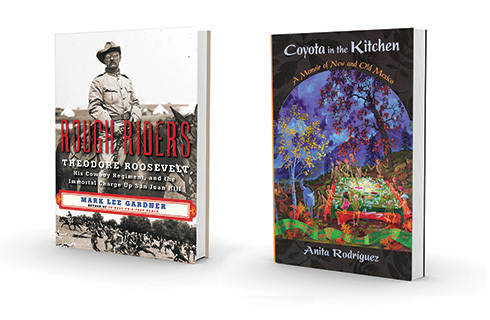 Published as part of the UNM Press Querencia series, which has featured such indelible voices as Don J. Usner, Juan Estevan Arellano, and Enrique R. Lamadrid, Coyota celebrates the weeknight cooking that has sustained generations. Those lucky enough to have grown up in this culture will spot their tíos and comadres on every page. Those who wish they could claim such roots will fall into a family big enough to cure your cold, break your heart, drive you crazy, and make you laugh. Just remember to save room for the Chocolate, Tequila, and Persimmon Mortal Sin Pie.